Today's modern anesthetic monitors have made surgery much safer than in the past. Here at All Creatures Veterinary Hospital, whenever possible, we do a thorough physical exam on your pet before administering anesthesia. Pre-anesthetic blood testing is important in reducing the risk of anesthesia, and to get a good "snapshot" of your pet's current health status. For most pets, we recommend blood testing before surgery to ensure that the liver and kidneys can adequately handle anesthesia. Even apparently healthy animals can have serious organ system problems that cannot be detected without blood testing. If there is a problem, it is much better to find it before it causes anesthetic or surgical complications. Animals that have minor dysfunction will handle the anesthetic better if they receive IV fluids during surgery. If serious problems are detected, surgery can be postponed until the problem is corrected. We will always go over blood testing options, and any other recommended tests, with you before your pet's procedure. For many dogs, we may recommend an oral anti-inflamatory the day after surgery and several days after to lessen the risk of discomfort and swelling. We use newer medications, which are less likely to cause stomach upset and can be given even the morning of surgery. 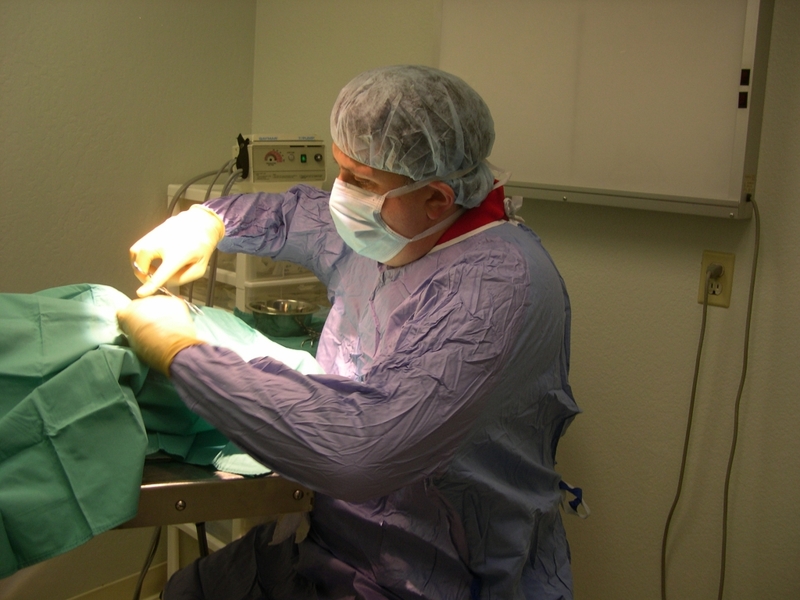 While your pet is under anesthesia, it is often the ideal time to perform other minor procedures, such as dentistry, ear cleaning, or implanting an identification microchip. If you would like an estimate for these extra services, please call ahead of time. This is especially important if the person dropping the pet off for surgery is not the primary decision maker for the pet's care. When you bring your pet in for surgery, we will need to 5 to 10 minutes of time to fill out paperwork and make decisions on the blood testing and other options available, if this hasn't already been discussed ahead of time. When you pick up your pet after surgery you can also plan to spend about 10 minutes to go over your pet's home care needs.